PMI North India Chapter reserves the right to modify the terms of this Agreement at any time, and will post a notice of such changes. The changes become effective immediately upon posting (the "Effective Date"). If any change to the Agreement is not acceptable to you, you must stop using the Services. Your use of the Services after the Effective Date shall constitute your acceptance of such changes. If we make any new products or services available, they will be considered a part of the Services and your use of them will be governed by the terms and conditions of this Agreement unless we notify you that different terms and conditions apply. You must also comply with any additional terms which apply to third-party content, material, information, software or other services. 2.2 The term "Interactive Services" refers to message boards, chat boards, blogs, virtual communities, and other interactive media made available by PMI North India Chapter via the Site. 2.3 The term "PMI North India Chapter Intellectual Property" refers to, all text, graphics, images, trademarks, logos, button icons, programs, software and other data, content, information and materials, tangible and intangible, and all intellectual property rights in and to the same which are owned by PMI North India Chapter or licensed to PMI North India Chapter by third parties. This includes but is not limited to PMI North India Chapter Content, PMI North India Trademarks and PMI Trademarks. 2.4 The term "PMI Trademark(s)" refers to all trademarks and service marks owned by PMI, as defined by 15 U.S.C. Â§ 1127. 2.7 The term "PMINIC Content" or "PMI North India Chapter Content" refers to copyrighted content owned by PMI North India Chapter or other copyrighted content owned by third-party partners of PMI North India Chapter. 2.10 The term "User Content" refers to all information, data, text, software, music, sound, photographs, graphics, video, messages, tags, or other materials posted on or to the Interactive Services sections of the Site by Users. 2.11 The terms ''you'', "your" and/or ''user'' refer to any individuals and/or entities accessing the Site for any reason. 3.1 Ownership and Use. PMI North India Chapter Intellectual Property, which excludes the User Content you upload, post or otherwise transmit via Interactive Services (the "PMI North India Chapter Intellectual Property"), is owned by PMI North India Chapter or licensed to us by our third party partners. PMI North India Chapter Intellectual Property does include, however, any content developed and/or posted via the Interactive Services that has been created in whole or in part by PMI North India Chapter. You have no rights in or to such PMI North India Chapter Intellectual Property and you agree you will not copy, retransmit, reproduce, publish, create derivative works based upon or otherwise transmit any PMI North India Chapter Intellectual Property, except as specifically permitted under this Agreement. 3.2 PMI North India Chapter Content. As a courtesy to our customers and members, we have posted to the Site certain PMI North India Chapter Content. Unless otherwise specifically set forth on the Site or we give you written permission, you may only use and access, download and copy the PMI North India Chapter Content (and print a single copy) for your personal use, and you agree you will not alter, erase or otherwise obscure our copyright, proprietary or other notices on the PMI North India Chapter Content. You may not do or allow anyone else to do anything with the PMI North India Chapter Content which is not specifically permitted under this Agreement. You acknowledge and agree that the PMI North India Chapter Content is made available for informational and educational purposes only without representation or warranty of any kind and is not a substitute for legal advice or your professional judgment. Your reliance upon PMI North India Chapter Content obtained by you on or through the Services is solely at your own risk. All rights not expressly granted in this Agreement are reserved to PMI North India Chapter . 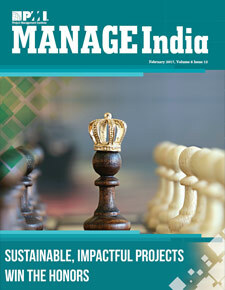 3.3 Permission to Use PMI North India Chapter Content. You may request permission to reproduce all or a portion of PMI North India Chapter Content owned by PMI North India Chapter via the Permissions section of the Site. We reserve the sole discretion to determine whether, and upon what terms, PMI North India Chapter Content will be licensed. Depending on the nature and scope of intended use licensing fees may apply. 3.4 Trademarks: The PMI North India Chapter Trademarks ("Marks") appearing on this site may not be used in any advertising or publicity, or otherwise to indicate PMI North India Chapter's sponsorship of or affiliation with any product or service, without PMI North India Chapter's prior express written permission. You are prohibited from using PMI North India Chapter Marks or any names, marks, or other materials in a manner that is likely to cause confusion or dilute or damage the reputation or image of PMI North India Chapter. You agree you will not alter any PMI North India Chapter Mark in any manner to make it appear that PMI North India Chapter is endorsing, sponsoring, authorizing or affiliated with you, your company, or any third party, except as expressly permitted in writing by PMI North India Chapter. Additionally, you agree to be bound by and to follow the terms of PMI North India Chapter's Trademark Usage Guidelines, the entire contents of which are incorporated herein by reference and made a part of this Agreement. 4.2 Linking to PMI North India Chapter.You may obtain permission to link to the Site by agreeing to adhere to the terms of the Linking Agreement. not advertise or solicit anyone to buy or sell products or to make donations of any kind absent prior written approval from PMI North India Chapter, as set forth in more detail in Section 6 below. 5.2 License to PMI North India Chapter. You hereby grant to PMI North India Chapter a non-exclusive, worldwide, royalty-free, irrevocable perpetual license (with right to sublicense) to reproduce, distribute, transmit, create derivative works of, publicly display and publicly perform any User Content you submit via the Interactive Services by all means and in any media now known or hereafter developed, solely for the purposes for which such User Content was submitted. PMI North India Chapter will not use this User Content for any purpose other than the purpose(s) for which it was submitted unless you agree to such use. You retain ownership of User Content you submit and PMI North India Chapter does not obtain ownership in or to such User Content (or in the case of third-party owned User Content submitted by you with the owner's permission, the third party retains ownership). 6.1 PMI North India Chapter respects the intellectual property rights of others. PMI North India Chapter may, under appropriate circumstances and at its discretion, disable and/or terminate access to or use of the Service for those users who may be infringing the intellectual property rights of others. A copyright owner who believes his/her work has been used on the Site in any manner that constitutes copyright infringement must notify PMI North India Chapter's designated agent by written notice. The notice must include the following information: (a) the owner's name, address, telephone number, email address, and an electronic or physical signature; (b) a description and a copy of the work that is allegedly being infringed, or a website where the work may be found; (c) identification of the location of the infringing material on the Site; (d) a statement that the owner has a good faith belief that the use of the copyrighted material was not authorized by the owner or his/her authorized agent; and (e) a statement, under penalty of perjury, that the information in the notification is accurate and made by the copyright owner of the material allegedly infringed or authorized to act on the copyright owner's behalf. Upon receiving the proper notification, PMI North India Chapter will remove, or disable access to, the allegedly infringed material from the Site. 7.1 In consideration of your use of the Site, you represent and warrant that you are of legal age to form a binding contract and are not a person barred from receiving services under the laws of the United States or other applicable jurisdiction. You also agree to: (a) provide true, accurate, current and complete information about yourself as prompted by the relevant portions of the Site (the "Registration Data") and (b) maintain and promptly update your Registration Data to keep it true, accurate, current and complete. If you provide any information that is untrue, inaccurate, not current or incomplete, or PMI North India Chapter has reasonable grounds to suspect that such information is untrue, inaccurate, not current or incomplete, PMI North India Chapter has the right to suspend or terminate your access to the Site and refuse any and all current or future use of the Site, or any portion thereof. EXCEPT AS EXPRESSLY SET FORTH HEREIN, THE CONTENT ON THE SITE (INCLUDING BUT NOT LIMITED TO ALL PMI NORTH INDIA CHAPTER INTELLECTUAL PROPERTY, TEXT, MATERIALS, SOFTWARE, FUNCTIONS, SERVICES, AND INFORMATION MADE AVAILABLE HEREIN OR ACCESSED BY MEANS HEREOF) IS PROVIDED AS IS, WITHOUT WARRANTIES OF ANY KIND, EITHER EXPRESS OR IMPLIED, INCLUDING BUT NOT LIMITED TO, WARRANTIES OF MERCHANTABILITY AND FITNESS FOR A PARTICULAR PURPOSE. UNDER NO CIRCUMSTANCES WILL PMI NORTH INDIA CHAPTER BE LIABLE IN ANY WAY FOR ANY CONTENT, INCLUDING, BUT NOT LIMITED TO, ANY ERRORS OR OMISSIONS IN ANY CONTENT, OR ANY LOSS OR DAMAGE OF ANY KIND INCURRED AS A RESULT OF THE USE OF ANY CONTENT POSTED, E-MAILED, TRANSMITTED OR OTHERWISE MADE AVAILABLE VIA THE INTERACTIVE SERVICES. PMI NORTH INDIA CHAPTER DOES NOT WARRANT OR GUARANTEE UNINTERRUPTED ACCESS TO THE SITE, OR ANY SITE LINKED TO THE SITE. YOU ASSUME FULL RESPONSIBILITY AND RISK OF LOSS RESULTING FROM YOUR USE OF THIS SITE AND ANY INFORMATION ON THIS SITE. SOME JURISDICTIONS DO NOT ALLOW THE EXCLUSION OF CERTAIN WARRANTIES. ACCORDINGLY, SOME OF THE ABOVE EXCLUSIONS MAY NOT APPLY TO YOU. TO THE MAXIMUM EXTENT PERMITTED BY APPLICABLE LAW, NEITHER PMI NORTH INDIA CHAPTER, ITS LICENSORS, SUPPLIERS, PARTNERS, AFFILIATES OR THIRD-PARTY SERVICE PROVIDERS SHALL BE LIABLE TO YOU OR ANY THIRD PARTY FOR ANY DIRECT, INDIRECT, INCIDENTAL, SPECIAL, EXEMPLARY, PUNITIVE OR CONSEQUENTIAL DAMAGES, OR ANY OTHER FORM OF DAMAGES IN ANY MANNER ARISING OUT OF OR IN CONNECTION WITH THIS AGREEMENT OR YOUR USE OF THE SITE AND SERVICES, REGARDLESS OF THE FORM OF ACTION OR THE BASIS OF THE CLAIM OR WHETHER OR NOT PMI NORTH INDIA CHAPTER HAS BEEN ADVISED OF THE POSSIBILITY OF SUCH DAMAGES. SOME JURISDICTIONS DO NOT ALLOW THE LIMITATION OR EXCLUSION OF LIABILITY FOR INCIDENTAL OR CONSEQUENTIAL DAMAGES. ACCORDINGLY, SOME OF THE ABOVE LIMITATIONS AND EXCLUSIONS MAY NOT APPLY TO YOU. PMI North India Chapter reserves the right to terminate, block or restrict your access to or use of the Site for any breach or violation of any term(s) of this Agreement. In such event, we may terminate this Agreement, restrict, suspend or terminate your access to and use of the Services immediately and without notice or liability, with or without cause, and it will not limit any other rights or remedies which are available to us. You may terminate this Agreement by providing us with written notice of your termination and ceasing to use or access the Services. Termination is your sole right and exclusive remedy if you are not satisfied with the Services. Upon the effective date of any such termination, your right to access and use the Services shall immediately cease. 12.1 This Agreement shall be governed in accordance with the laws of the India. Additionally, you also agree that the UN Convention on Contracts for the International Sales of Goods and the Uniform Computer Information Transactions Act (UCITA)will not apply to this Agreement or any interpretation or disputes relating thereto. 12.2 All disputes under this Agreement shall be resolved by litigation in the State courts of the New Delhi, India and all parties consent to the jurisdiction of such courts, agree to accept service of process by mail, and hereby waive any jurisdictional or venue defenses otherwise available to it. This Agreement is personal to you, and you may not assign this Agreement or the rights and obligations hereunder to any third party without the prior express written approval of PMI North India Chapter.